With my painting desk finally set up and Halloween approaching at full tilt, I’ve been painting a lot in the last couple of days. It’s time to showcase my first finished minis in god knows how long. The first one is a pirate from Black Scorpion. I really love the posing of this mini, it makes for a nice change compared to typical fighting poses and gives the character a whimsical, flirty feel. I painted the legs as having pants on because I’m quite sure no one would choose to dress their female minis in a cropped top and a loincloth while the men are fully clothed, amirite Black Scorpion? 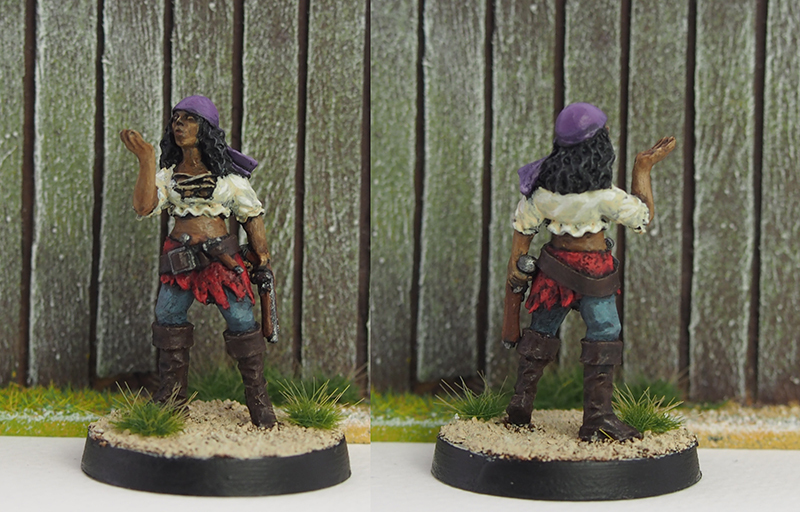 For a bit of diversity and a painting challenge I went for non-caucasian skin which I think turned out nicely. The closed eyes are a nice touch and saved me the trouble of painting eyes! 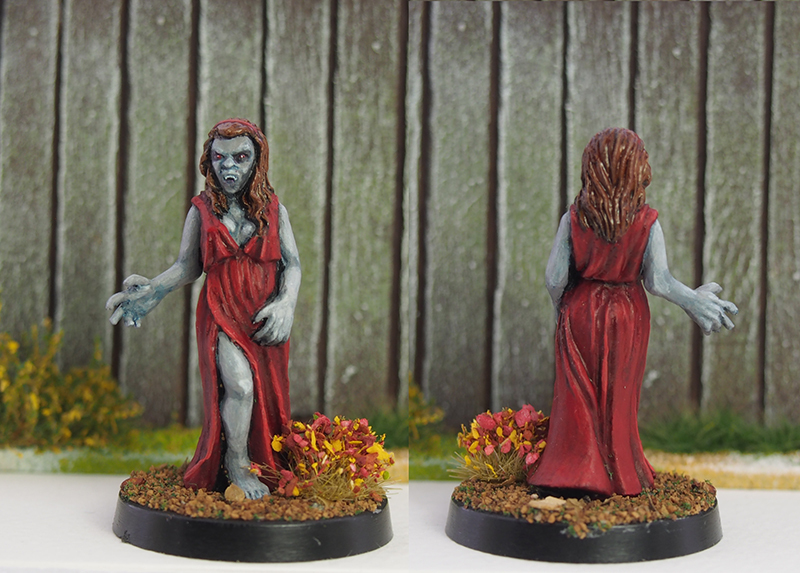 The second miniature is a vampire from Bad Squiddo’s My Last Sunrise Kickstarter. It’s a wonderful sculpt of one of Dracula’s brides. I love the combination of alluring and monstrous on the mini – the exposed leg and flowing dress create a wonderful contrast with the snarling, beast-like face and the hand that is almost a claw. And no, that’s not white in her hair! I haven’t yet given this mini a blast of matt spray so the old Citadel ink I used catches the light something awful. This was super fun to paint! A really crisp, clean sculpt and it was easy to make her look good. The drapery is great and the face is full of character. Of the three female vampires in the KS, this one looks least like a human, prompting me to paint her in a very gray, inhuman tone. For the base I went with my autumn mix as it fits the horror theme much better than my bright Caribbean basing. It’s really good to be back in painting action. Hopefully plenty more blog posts on the horizon too! Thanks ork, it’s good to be back! Both very nicely done, but with so many differences between the two! Love ’em! Thank you, really happy to hear that! They make quite the contrasting pair. Nice job on both minis mate – great to have you wielding the hairy stick again! Nice work on both of those Mikko, the grey skin worked out well. The Last Sunrise figs are great.